Quite simply, this stove is incredible! 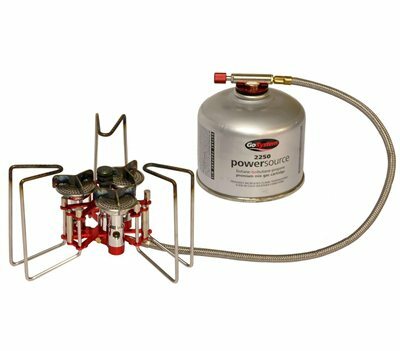 The ultimate in power this light, compact stove burns vapour and liquid gas via a remote GoSystem EN417 gas cartridge. Featuring a newly developed triple burner head with precision flame control, it can boil half a litre of water in just 57 seconds. The wide serrated sprung pan supports and legs fold in and along with the easily coiled braided hose create an easily "packed away" unit ready for transportation. Comes complete with carry/storage stuff sack.